Hug a Tree…And Celebrate Arbor Day. The tallest species of trees in the world include the Coast Redwood, Giant Sequoia, Coast Douglas Fir, Sitka Spruce and Australian Mountain Ash. The Giant Sequoia is not only tall, it is also wide. Because of its amazing size, some believe that the Giant Sequoia is the largest living organism in the world! Trees produce oxygen and reduce the amount of carbon dioxide in the atmosphere. They purify the air we breathe. If it weren’t for trees, we wouldn’t be alive! 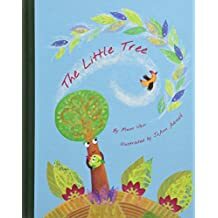 There are lots of picture books that honor trees. Here’s one I especially enjoy. Visit this blog on Monday, 4-30-2018 for my poem honoring the Oak Tree. Now, go outside and hug a tree! HAPPY ARBOR DAY! The winner of a signed copy of the PB SCOOP THE ICE CREAM TRUCK by Patricia Keeler + the pin and magnet to go with it is…Sheri Dillard. Congratulations! and thanks to all who participated in the give-away. Laurie Wallmark Presents: STEM books with Curriculum Guides for Teachers. Looking for great STEM books to use in the classroom? Check out these gems from Award-winning author Laurie Wallmark. Grace Hopper: Queen of Computer Code and Ada Byron Lovelace and the Thinking Machine are picture book biographies of computer science pioneers. These book and the associated teacher guide activities are appropriate for grades K-5. Award-winning author Laurie Wallmark’s debut picture book, Ada Byron Lovelace and the Thinking Machine (Creston Books, 2015), received four starred trade reviews (Kirkus, Publishers Weekly, Booklist, and School Library Journal) and many national awards including Outstanding Science Trade Book and Cook Prize Honor Book. Her latest picture book biography, Grace Hopper: Queen of Computer Code (Sterling Children’s Books, 2017), earned a Kirkus star and is on several public library’s best of lists. Laurie has an MFA in Writing for Children and Young Adults from VCFA. When not writing, she teaches computer science at Raritan Valley Community College.